Now that AWS is supporting SDSS, there is probably useful integration between the Worldwide Telescope and the SDSS datasets that can be leveraged, beyond what is currently supported - such as seeing the all the known galaxies in a 3D view – seeing the lattice structure of the universe. Search and Browse data from the Virtual Observatory and plot data over imagery: WorldWide Telescope delivers one-click contextual access to distributed Web information and data sources and Interoperates through SAMP and other popular tools like TopCat, Aladin, SAOImage DS9 and many more. Data derived from researchers using the AWS datasets can integrate imagery and catalog data directly into WorldWide Telescope using the WWT Developer Kit. 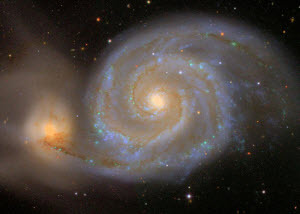 The Sloan Digital Sky Survey, or SDSS, is now available as a Public Data Set. Weighing in at 180 GB, the SDSS is the most ambitious astronomical survey ever undertaken. The researchers have used a 2.5 meter, 120 megapixel telescope located in Apache Point, New Mexico to capture images of over one quarter of the sky, or about 230 million celestial objects. They have also created 3-dimensional maps containing more than 930,000 galaxies and 120,000 quasars.